The physical characteristics of superior thermal conductivity, strength, durability and shape and structure maintenance at absurdly high temperatures are a few of the reasons graphite is so popular. 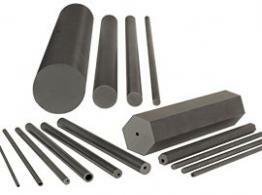 Graphite is able to remain constant in terms of thermal stability and dimensions even at temperatures approaching 5000°F and so is able to be used in many high temperature applications The tubes formed from machined graphite are used commonly in furnaces and heating elements because of the material’s low heat sensitivity. Other common uses include degassing shafts and impellers, fluxing and injection tubes and when used as carbon graphite is used in the fabrication of objects for many recreational uses such as kite or tent frames, kayaking riggers and handles and fishing rods. Graphite has high corrosion resistant properties and is not affected by thermal shock as many other materials are; this makes it an ideal choice for products which will be exposed to extremes of elements and potential stresses. The tubes are formed through the process of graphite machining either through extrusion, compression molding or isostatic pressing. The different processes result in unique grades of graphite which may be more suited to some applications than others. Manufacturing processes most often use extruded or pressed graphite. Isostatically pressed tubes or graphite rods and plates use much finer graphite particles and therefore smoother surfaces. Custom specifications are easily met due to the nature of machining processes and tubes can vary in length, diameter, wall thickness and flexibility. Unlike metals, graphite increases in strength with rising temperatures and is less likely to break down with age or wear and tear. Graphite tubes or graphite rods can be coated or left uncoated; however coating will improve the tube life of the product, especially for those intended for prolonged exposure to extreme heat. Siloxane is often used as a coating material in graphite machining as it is able to prevent oxidization even at extended high temperatures. In addition, metallic graphite combinations may be used but the material tends to be less effective in terms of electrical conductivity and durability than pure graphite. However, copper graphite has improved conductivity and strength, even over pure graphite and although it is more expensive, it is worth the investment for specialized applications. Graphite Tubes Graphite tubes are lengths of cylinder or tubing formed from machined graphite or graphite mixtures. These tubes are used often in furnace and heat applications due to graphite's physical properties.